Internal dissent in Jaysh Khalid ibn al-Waleed?
. Liwa Shuhada' al-Yarmouk (the Yarmouk Martyrs Brigade: LSY)- the main component of Jaysh Khalid ibn al-Waleed. Once aligned with the Western-backed Southern Front, it first established connections with IS around summer 2014 and began overtly displaying affinities with IS after heavy clashes with Jabhat al-Nusra in December 2014, which accused LSY at the time of being aligned with IS even as observers were widely sceptical.
. Islamic Muthanna Movement (IMM)- a jihadi group originally founded in 2012 that was once spread across Deraa and Quneitra provinces that tried to mediate between Jabhat al-Nusra and LSY in December 2014. It issued a controversial statement in March 2015 that rejected the IS Caliphate declaration but seemed to show sympathy to IS in fighting the 'states of kufr' and called for an end to infighting among Islamic factions. The group was accused of a number of assassinations targeting opponents, including the head of the Dar al-'Adl judicial body in the south who was called Osama al-Yatim. By January 2016, open clashes erupted between IMM and rebel groups, resulting in the retreat of the main contingent westwards to establish governance in some localities just east of LSY territory, while a smaller contingent that had not clashed with other factions remained in Deraa city. In March 2016, after establishing its new main base, IMM cooperated with LSY in a new offensive launched by the latter that ultimately failed. As a result, IMM lost all its territorial holdings and had to retreat into LSY territory, while the Deraa city contingent defected.
. Jama'at al-Mujahideen- remnants of the Saraya/Jaysh al-Jihad group in Quneitra that was routed by rebels in 2015 on charges of ties to IS. The group subsequently took refuge in LSY territory. "#Important #Note: The Telegram administration has closed the first and second channel for #Jaysh_Khalid ibn al-Waleed (may God be pleased with him, and there is currently no media voice in the name of the army via Telegram or any other means of connection. Coverage of the army's news will be done through Amaq Agency until a new channel is opened." 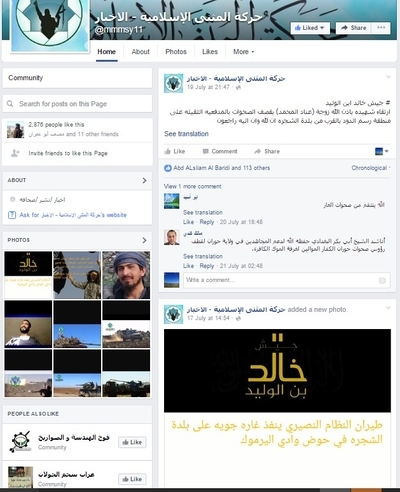 The main media page on Facebook for IMM, "Islamic Muthanna Movement- News" (@mmmsy11), has notably continued to promote Jaysh Khalid ibn al-Waleed as of 19 July, as per below. However, all has not been well in the integration of IMM into the Jaysh Khalid ibn al-Waleed merger. To begin with, it should be noted that the first announcements of Jaysh Khalid ibn al-Waleed followed the mysterious death of IMM's number two guy known as Abu Omar Sawa'iq, whose real name was Zakariya al-Masri. He was notably reported to be among those in IMM who opposed merging with LSY. Supposedly he was killed by an accidental IED explosion in his home. One might suspect foul play. In addition, since Jaysh Khalid ibn al-Waleed was formed, at least two prominent people from IMM have been caught by rebels following their fleeing of the Yarmouk Valley area. 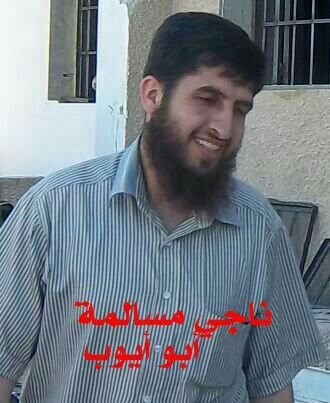 On 21 June, it was reported that the IMM Shari'i official Abu al-Yaman al-Shamsi (aka Muhammad Shamsi) was arrested by Ahrar al-Sham in the Azaz area in north Aleppo countryside near the border with Turkey, as he and his brother were apparently trying to flee to Turkey. Abu al-Yaman al-Shamsi was said to have been responsible for legitimising the assassinations conducted by IMM including the killing of Osama al-Yatim. Furthermore, on 26 June, it was reported that rebels in the south had arrested IMM security official Abu Nimr al-Hawrani. The site All4Syria cited a source as saying the arrest had occurred around a month before the announcement of his arrest, as he had tried to flee to Jordan. Now, multiple sources have confirmed to me that IMM leader Abu Ayyub al-Masalama (aka Naji al-Masalama) has left the Yarmouk Valley. One source, Abu al-Waleed al-Baridi from Jaysh Khalid ibn al-Waleed, explained that Abu Ayyub has gone to Raqqa, while denying that his leaving the Yarmouk Valley is due to a disagreement with Jaysh Khalid ibn al-Waleed. Rather, he explained: "He [Abu Ayyub] left for there because he did not like the situation here [in the Yarmouk Valley], and for reasons that only those close to him know. There is talk that he has gone there [to Raqqa] for a trial against him, but I am not sure of this recent information." Two other sources pronounced harsher views on Abu Ayyub. "Frankly he is among the personalities I do not like," said one person from Shajrah supportive of Jaysh Khalid ibn al-Waleed. Abu Ayyub is described as having given an allegiance pledge (bay'a) of some sort (apparently to LSY), but this source characterized that pledge as a "bay'a of idle talk." He elaborated: "When he acknowledged that he could not confront the Free Army, he took refuge with Liwa Shuhada' al-Yarmouk. He lost most of his weapons in his battle in Adwan." As for the claim that Abu Ayyub has gone to Raqqa, this source said: "It is on such grounds, but after a time you will hear that he is in Germany." Similarly, Abu Ahmad al-Baridi (who was close to original LSY leader al-Khal) characterized Abu Ayyub's departure from the Yarmouk Valley as "fleeing under the pretext of going to the north of Syria." He denounced Abu Ayyub as an "insolent liar," elaborating as follows: "He gave a bay'a of idle talk some time ago. Al-Khal offered to him unification, he rejected. But he was not able to face the Free Army, so he took refuge with us." For context, note that al-Khal was assassinated in November 2015. It seems he had tried to outreach to IMM before the full fighting in January 2016 between rebels and IMM in order to join forces. The tensions with LSY can be traced to two main factors. First, IMM cannot be seen in origin as an IS-linked group. Second, it seems a number have become disillusioned with the group's losses and the humiliation of having to seek refuge in the Yarmouk Valley, trapped there in subordination to LSY. This contrasts with previously being spread throughout Deraa and Quneitra provinces and widely being recognised as an important rebel force in the south. At the time when LSY began establishing links with IS, it should be remembered that IMM actually clashed with LSY. IMM certainly had a number of IS sympathisers in its ranks, some of whom apparently went north to join IS in 2015, but as the IMM statement back in spring 2015 made clear, the leadership still rejected the IS Caliphate idea. The anti-fitna notions and sympathy for fighting non-Muslim powers in that statement do not automatically translate to an allegiance to IS. A number of other jihadi groups- including al-Qa'ida branches in the Arabian Peninsula and the Maghreb- expressed similar sentiments back in autumn 2014 as the international campaign against IS had commenced, even though it was clear at the time they were not going to pledge allegiance to IS. Even when IMM and LSY began cooperating in spring 2016, IMM controlled a separate domain of territory. Once it lost those holdings and had to retreat into LSY territory, IMM was severely weakened. According to Abu al-Waleed al-Baridi, "They were originally [i.e. when they had to retreat into the Yarmouk Valley] not much. In number they did not exceed 60 people. Some of them stayed, some left for Raqqa, and some abandoned arms." As for Abu al-Yaman al-Shamsi (the IMM member who tried to flee to Turkey and was arrested in Azaz), Abu al-Waleed al-Baridi explained that "he was not a Shari'i, but rather an admin official for the Shari'is and official of the Shari'i office, and he had left al-Muthanna some time ago, from the time of their entry into the Hawdh." The source from Shajrah supportive of Jaysh Khalid ibn al-Waleed affirmed that "most of them have shaved their beards and fled from the Hawdh." He added that "30 of them have remained, most of them Shari'i officials. And from their Majlis al-Shura [consultation council], only one remained- Abu Ayyub [i.e. he served as head of the council]- but now he has fled." The tensions between IMM and LSY even following the formation of Jaysh Khalid ibn al-Waleed give a more nuanced view of IMM and its development. Rather than simply establishing links with IS in the manner LSY did, it seems that in a way, IMM was forced into this position through its clashes with other rebels and defeats at their hands. That is not to overlook IMM's assassinations of rivals or the existence of sympathisers in the ranks (many of whom went up north to join IS in 2015), but those acts should be seen in the context of IMM trying to build its own influence in the south with many in the group at least admiring IS' methods of dealing with rivals, rather than necessarily doing the bidding of IS all along through a secret pact. At least some members of IMM were alienated by IMM actions as time went on last year. One of the founders of IMM who defected in around August 2015 told me in late March 2016: "It used to be a fine movement...until extremist thought made progress in it without realization...and it arrested people, stole arms, killed Sheikh Osama al-Yatim on the pretext of apostasy, arrested Ya'qub al-Ammar, stole weapons of Darayya, and other deeds besides those...so it wronged the people." Though this contact suspected links with IS, he did not have specific inside evidence to demonstrate that this was the case: "They are Dawla [IS] deeds, though it [IMM] denies its link, but it is practically connected. God knows best." Interestingly, he concluded by comparing IMM with Jund al-Aqsa in the north, which has tended to take a more hardline approach to rivals and the implementation of Shari'a than what was previously known as Jabhat al-Nusra and so has been suspected of IS links as some members have even gone to join IS, though its leadership has in fact made clear it is not connected with IS. The internal tensions regarding the integration of IMM under Jaysh Khalid ibn al-Waleed should not give rise to illusions of a supposed imminent collapse of Jaysh Khalid ibn al-Waleed or a major shift in dynamics in its war with the rebel factions in the near future. By the time IMM had to flee into IS territory, its numbers clearly did not exceed more than several dozen, and in military terms, Jaysh Khalid ibn al-Waleed overwhelmingly remains LSY. Jaysh Khalid ibn al-Waleed also likely maintains cells elsewhere in Deraa and Quneitra provinces to conduct assassinations. In short, the internal dissent is of interest but it does not dramatically alter the current state of affairs.